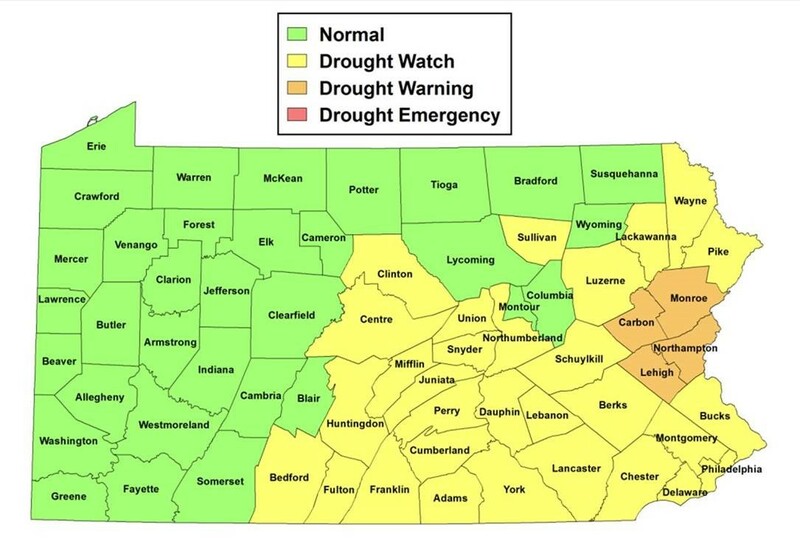 According to the Pennsylvania Department of Environmental Protection, four counties in eastern Pennsylvania: Lehigh, Northampton, Carbon and Monroe remain under drought warning, while the rest of the state is considered under the milder drought watch or normal conditions. Under a drought warning, the public is encouraged to voluntarily conserve water use. Western Pennsylvania and the northern tier are considered normal in terms of their overall risk for a drought. The central and southeastern parts of the state remain under a drought watch, the next level of concern in Pennsylvania’s four-tier drought classification system. Those four levels, in increasing level of concern, are: normal, drought watch, drought warning and drought emergency. In a drought emergency, water use restrictions come into play that would affect Pennsylvania’s green industry. Fortunately, no parts of Pennsylvania are currently in that condition. For future reference, you may download a copy of those restrictions by clicking here. We are hoping for sufficient precipitation this winter to keep Pennsylvania in the normal range and out of drought emergency status.